"Even though there are not a lot of different ingredients in this braised chicken dish, those used in this recipe offer a wide range of textures and tastes." Coat bottom of a Dutch oven with olive oil and place over high-heat. Sear chicken until browned, about 5 minutes per side. Transfer to a warm plate. Stir onion, garlic, black pepper, salt, and red pepper flakes into the Dutch oven; cook and stir for 1 minute. Stir in chicken broth and return to a simmer. Remove from heat. Return chicken to the Dutch oven. Stir in artichoke hearts, cherry peppers, lemon juice, and thyme. Cover Dutch oven and place in the preheated oven. Cook until chicken is tender, about 1 hour. 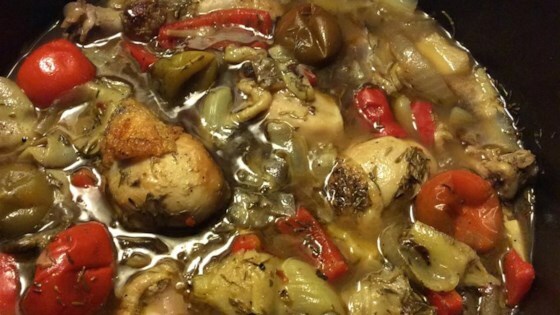 Remove Dutch oven and transfer chicken to a warm plate. Stir beans into the Dutch oven with broth and artichoke mixture. Serve each chicken leg quarter in a bowl. Pour a ladle-full of artichoke, bean, and broth mixture over each. A colorful, hearty stuffed pepper dish. May substitute sweet red bell peppers for cherry peppers and white beans for butter beans. This was fantastic! In spite of what the chef says, Peppadew peppers are the real secret ingredient. Don't be tempted to use cherry peppers, it will not be the same and not in a good way! Way to much lemon and I only used 1. Other than that this was a tasty different dish.